Reception have been learning about Polar animals so we went to Lotherton hall to look at the Humbolt penguins - we had a fabulous time! Reception class had their first session of gymnastics, they did lots of careful balancing and jumping and could tip-toe brilliantly across the mats. Reception Class had a fabulous afternoon at Middleton Railway. They had a lovely ride on a steam train with Father Christmas and were so well behaved Father Christmas gave them all a present each. This is what we are learning about this term. We are having a super week at school! Reception Class have been learning the story of the Hungry Caterpillar by Eric Carle. Their assembly was fantastic, they performed some lovely songs and told the story beautifully - the parents loved it! The sun shone when Reception Class visited Hesketh Farm Park. They had an amazing day; feeding lambs, collecting eggs, stroking guinea pigs, holding chicks and playing in the playground, not to mention a tractor ride! Reception Class had a great time on the sponsored walk, they were all very cheerful and enthusiastic - well done everybody! 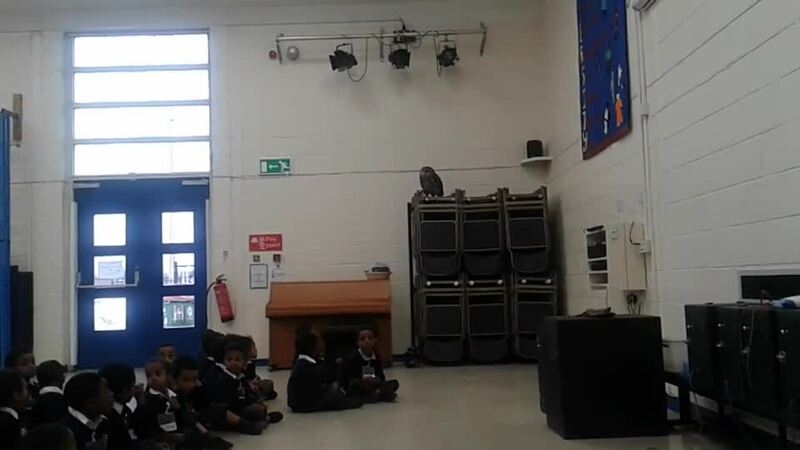 As part of our topic about nocturnal creatures we had a visit from 5 real owls. 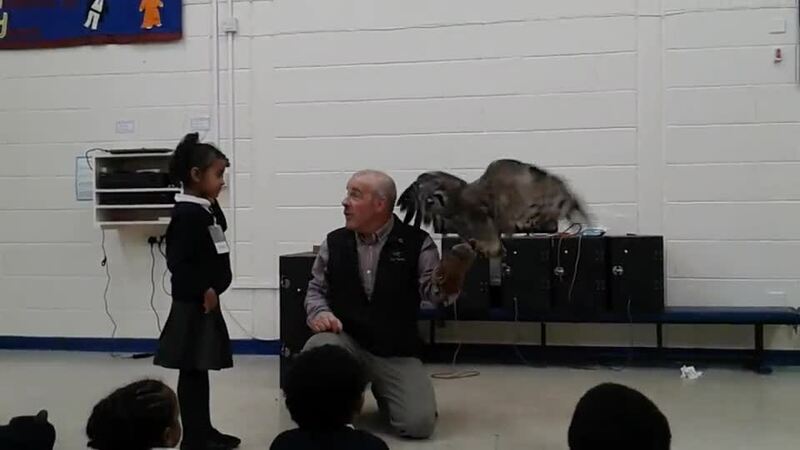 We looked at their special eyes, found out where their ears are and how sharp their talons are. Some of the owls flew across the hall, they were very silent. As part of International Week, Reception Class have been learning about England. We made masks of the queen, we counted to 6 with a London bus, we made pictures of soldiers from Buckingham Palace and made jam tarts. We had lots of fun! The photographer from the Yorkshire Evening Post came to school to take a picture of the new Reception children. The children listened brilliantly and all smiled beautifully for the camera. Once the picture is published, we'll send home a copy of the newspaper to all Reception families. Reception class first day at school! We are having a brilliant first day at school! Reception Class had a fantastic day out at Hesketh Farm. They enjoyed lots of different activities: tractor rides, feeding the lambs, holding the chicks and guinea pigs, as well as plenty of time to play in the playground - what an amazing day! We went on the mini bus to the library at Compton Road. We listened to some stories and then got to borrow a book each to bring back to school. We are looking forward to sharing our books with our mums and dads this week when they come into our class to look at our profiles. We can't wait to go back to the library to borrow a different book. Reception class have been practising their handwriting. They know lots of letters and sounds now. In Reception, the children have based lots of their learning around the story of Goldilocks and the Three Bears. As part of this they all made some porridge - most of the children really enjoyed it! The children all had a fantastic time learning the basics of skipping and are now enjoying skipping at play time! It is our first day at school! We are having a brilliant time!